The police in Ontario, Ohio have succeeded in capturing the image of a criminal who may stand unrivaled among the felon class. 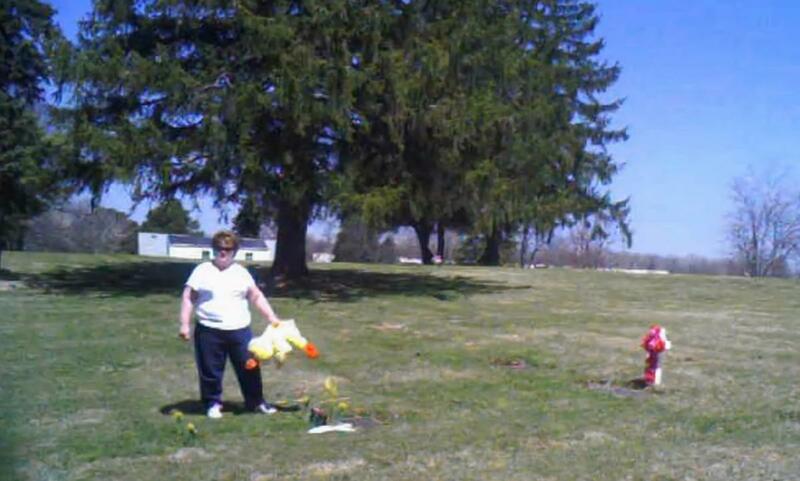 This picture was released with others of a woman who has been stealing toys off the grave of a dead infant. That’s right. Not just a grave robber but an infant grave robber. The police decided to set up a hidden camera and nailed these images. 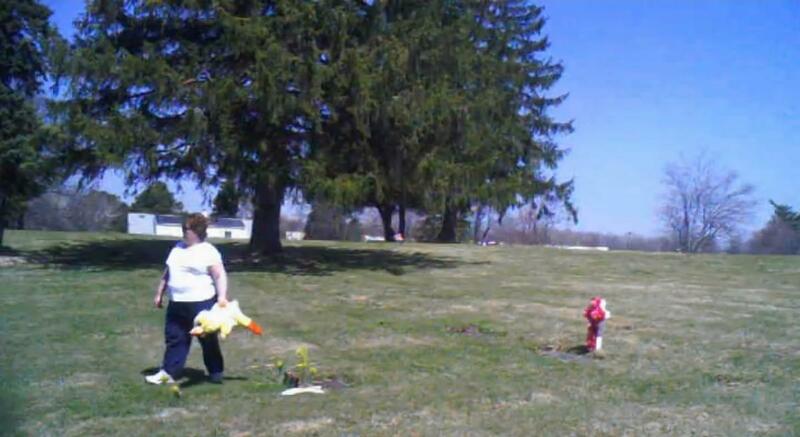 They are now seeking any leads on the culprit and, given the quality of the photographs, it would seem likely that the woman (shown here stealing a stuffed duck from the grave of Hayden “Tank” Cole Sheridan) will be identified. Tank died in 2007 at only 14 months. Obviously such loss is inexpressible for the family but they have sought some solace in leaving toys at this grave site. However, someone has been appearing shortly after such visits and stealing the toys. The police thankfully did not shrug off the complaint and set up the hidden camera. They did a terrific job. On April 19th, they nailed a woman removing a stuffed duck and are now seeking people to help identify the culprit from photos and a video. This have been going on since 2012. (6) Any other object of reverence or sacred devotion. (B) Whoever violates this section is guilty of desecration. A violation of division (A)(1), (2), (3), (5), or (6) of this section is a misdemeanor of the second degree. Except as otherwise provided in this division, a violation of division (A)(4) of this section is a felony of the fifth degree that is punishable by a fine of up to two thousand five hundred dollars in addition to the penalties specified for a felony of the fifth degree in sections 2929.13 to 2929.18 of the Revised Code. If the value of the property or the amount of physical harm involved in a violation of division (A)(4) of this section is five thousand dollars or more but less than one hundred thousand dollars, a violation of that division is a felony of the fourth degree. If the value of the property or the amount of physical harm involved in a violation of division (A)(4) of this section is one hundred thousand dollars or more, a violation of that division is a felony of the third degree. (C) As used in this section, “cemetery” means any place of burial and includes burial sites that contain American Indian burial objects placed with or containing American Indian human remains. Presumably, they will hit the culprit with anything that they can find short of a violation of the migratory bird act. Anybody who might have information or recognize the woman in the video is asked to call the Ontario Police Department at (419) 529-2115. “The thing about the law …” is that is is blind to justice. We get just about as much justice as we can afford. I know that my comments tend to be long. Perhaps this is the reason that you failed to see that I did not leave out such a reason. Hint: It is two of the three sub-options in (A). Solid information seems to be thin on the ground in this case. We don’t know if the woman is the sole perp. We don’t know what her motivation was. Gain for herself is only one of the options. Yes indeed. The thing about the law is that is is not about justice. It seems to be about retribution, regardless of circumstances. It’s not about fixing things. It is about punishing things. How about 30 years minimum prison for a minor first drug offence? How about the US signifiicantly leading the world in percentage of population in jail? Why have prisons become big business for private corporations? I have to say that when I read this story, my immediate reaction was “Why would someone do that?” Then I considered options. I have had a look at some sites covering the story. It has been unusual to see comments that give the slightest consideration to total circumstances. It’s been pitchforks and burning torches, with the Net effectively being the hoods. It is certainly very easy to demonize the person removing the toys. Child’s grave – grieving parents – end of. The child died in 2007. It is not clear if a toy had been left and removed immediately on the burial and on every anniversary or random occasion since then. The story above just mentions toys being taken on a number of occasions..
Why would someone remove toys? Look at the photo. The area presumably has other graves but is clean flat grass with perhaps discreet markers. That’s a big bright toy for starters. I’ve seen graves where items have been left. They can get really messy after exposure to the elements. I do not know if there are formal rules for that graveyard regarding appearance and maintenance of graves. Many graveyards do. This is done to avoid ‘tasteless’ even if the lack of objective good taste is unconsciously triggered by intense grief. It is also done so that grass-cutting machinery can be used without having to stop and temporarily remove loose items during mowing. With or without rules, an officious person could take it into their heads to keep the place looking tidy. Say the person has their own child buried there. Say they feel that large colourful stuffed toys such as the one in the photos above are a desecration of the area. Maybe they like to come and see a clean tidy well-maintained area. I have no idea how exactly I would feel if one on my children was in a grave. I am certain that I would want the grave to be a restful place, where I could come and remember. What if the adjoining grave had large stuffed toys left on it, year after year? Let there for how long? Would they be left to deteriorate? Would they get blown over and lie there like something abandoned – something to do with childhood discarded like rubbish beside the grave of my child? I think that I would complain if I considered that those items were a problem. Yes – I should consider the feeling of others. Equally, they should consider my feelings. What if complaints / discussions / rules were to no avail? Would I take it on myself to keep the area clean? I don’t know – because I would be emotional to whatever degree. I can give no absolute guarantee about what I would or would not do in such circumstances. Doing this would label me as a vile monster by popular vote in this thread. Even raising complaints would probably label me so – but to a lesser degree. I don’t think that I am such. A story linked above indicates that a woman has given herself up. Can we assume that her questioning might have been harsh and unsympathetic? A snippet from the questioning seems to be that she thought a loose dog in the area might tear up the toy – make a mess. That’s not an unreasonable part of an entire story in the case of B,C and D above. I think the rush to judgement here has been much too knee-jerk. SlingTrebuchet, you left out the reason of many thefts, which is that the woman wanted the toy for herself or for her family or for her friends. The thing about the law is that it punishes actions not opinions of the mind. It does not matter why she took the toy. Taking the toy was wrong. Furthermore, it is especially egregious in the context of causing extra emotional damage to a person paying their respects to the dead. The woman did wrong. End of story. This judgment is not a knee-jerk reaction. Unfortunately, unless they have her on film removing more than one stuffed toy, they can’t really prove that she is the one that has been taking them all this time. Is there any mention of the police monitoring the grave site over a period of time, filming her in the act, and then releasing the one piece of video footage to help catch her? And if not, why not? Unless the police searched her home and found other stuffed animals that the family positively identified as ones they had left there. Kraaken, I nearly burst out laughing when I read Professor Turley’s “migratory bird” comment. Your observation is well taken (even though I believe the American Stuffedtoy Duck is not migratory, but still protected). CW: Couldn’t agree more. Someone should sew the stuffed duck to her shirt for all to see when she walks by! Maybe she was giving the toys to Toys For Tots. Maybe she thought that they were being left out on the ground to rot and needed a child. Al – her reported story is that a dog or dogs were around and she was afraid it or they would take it. joel – I thought the American Stuffedtoy Duck was off the endangered list. Still, I do not keep up on all of them, so who knows? Her attorney said she’ll plead not guilty May 8 to one count of theft, a first-degree misdemeanor. I am glad she got representation. This is going to be interesting. We should be seeing her soon on Smoking Gun. I see that Ontario, Ohio has a population of just over six thousand…I’m certain there isn’t any punishment the legal system can impose that will be worse for her than the scorn of a small town in a situation like this. The stuffed duck has become her ‘scarlet letter’. That IS a duck he’s holding, is it not? Ducks DO migrate, do they not? Looks like they can even get her on the ‘Migratory Bird Act’, too! There is an obvious difference to municipal or cemetery workers doing their job and removing objects left behind and a member of the public removing those same objects. And Darrel, everyone who is charged with a crime is entitled to a defense. Even if you think they are guilty. Darrel, You seem to have issues w/ the basic tenet of our criminal justice system. And now, may we have the usual dishonest criminal lawyers equally disgusting defense of this innocent until proven guilty lady???? ?